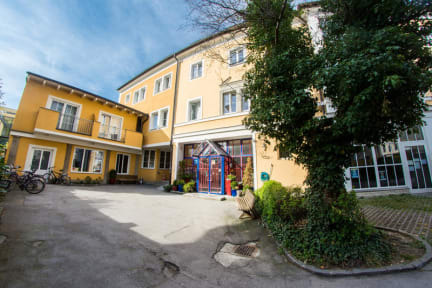 Yoho International Youth Hostel Salzburg i Salzburg, Österrike : Boka nu! Super bra! Grattis frukost och sallad mellan 18-21. Trevlig stämning bland alla. Många som åker själv och vill träffa andra. Tänkte stanna en natt men blev tre. The staff helped me with everything I needed, the atmosphere was great and the rooms were clean and good size, it was close enough to the train station and also very close to the city center so the location was perfect. I really enjoyed my stay here! Loved my stay in this hostel. The straff was amazing and there was a really nice atmosphere to hang out in. Showers and toilets were as clean as they can be. Great memories from this place! Bra hostel med bra rum, sköna sängar, låsbara skåp vid sängen, bra bar med tillhörande mat. Kunde köpa frukosttillägg för 4 euro som var gott men lite enformigt alternativ. Väldigt skön stämning, trots att själva platsen var lite off (men absolut inget problem, hade trots allt nära till både statskärnan och till centralstationen). Allt som allt ett gott alternativ som definitivt rekommenderas! It was an overall nice and clean hostel! It’s nice with the free breakfast. It was also nice to see the movie Sound of Music. Good hostel. A litel dusty in someplaces. We were not allowed to use the microwave in the morning. They Said they were having a electrical problem. The staff was nice and the hostel had big Open spaces. The location was a bit outside the city centre but very close to Walk anywere. It was a big hostel so didn't really get that "hostel" feeling but still very nice beds and good place! It was just one guy in the reception that was really rude and unkind! But liked the rest of the staff :)! !